Charles Darwin is easily the most famous scientist of the modern age, and his theory of evolution is constantly referenced in many contexts by scientists and nonscientists alike. And yet, despite how frequently his ideas are evoked, there remains a surprising amount we don’t know about the father of modern evolutionary thinking, his intellectual roots, and the science he produced. 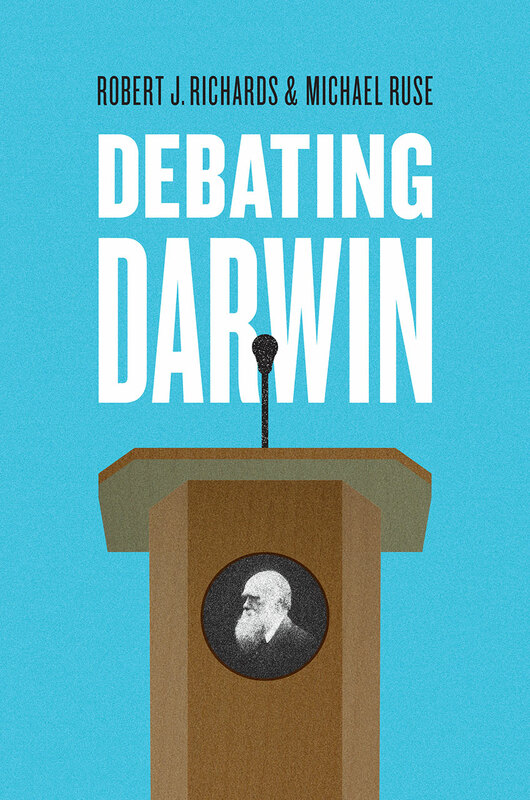 Debating Darwin seeks to change that, bringing together two leading Darwin scholars—Robert J. Richards and Michael Ruse—to engage in a spirited and insightful dialogue, offering their interpretations of Darwin and their critiques of each other’s thinking. Examining key disagreements about Darwin that continue to confound even committed Darwinists, Richards and Ruse offer divergent views on the origins and nature of Darwin and his ideas. Ruse argues that Darwin was quintessentially British and that the roots of his thought can be traced back to the eighteenth century, particularly to the Industrial Revolution and thinkers such as Adam Smith and Thomas Robert Malthus. Ruse argues that when these influences are appreciated, we can see how Darwin’s work in biology is an extension of their theories. In contrast, Richards presents Darwin as a more cosmopolitan, self-educated man, influenced as much by French and particularly German thinkers. Above all, argues Richards, it was Alexander von Humboldt who both inspired Darwin and gave him the conceptual tools that he needed to find and formulate his evolutionary hypotheses. Together, the authors show how the reverberations of the contrasting views on Darwin’s influences can be felt in theories about the nature of natural selection, the role of metaphor in science, and the place of God in Darwin’s thought. Revealing how much there still is to investigate and interrogate about Darwin’s ideas, Debating Darwin contributes to our understanding of evolution itself. The book concludes with a jointly authored chapter that brings this debate into the present, focusing on human evolution, consciousness, religion, and morality. This will be powerful, essential reading for anyone seeking a comprehensive understanding of modern-day evolutionary science and philosophy. "In most volumes with more than a single author, the contributors complement each other, addressing a common subject matter from a shared point of view. Robert J. Richards and Michael Ruse's Debating Darwin is unusual in the sense that its two authors disagree, profoundly so, about their joint topic of interest--Charles Darwin. . . . This format succeeds admirably well. Both Richards and Ruse are top-bracket historians and philosophers of science, and both have long been at the cutting edge of Darwin scholarship. While reading one author's persuasive account, one can't wait to read what the other could possibly have up his scholarly sleeve to outclass his opponent; and reading on, one equally eagerly anticipates the respective responses. . . . I strongly recommend this book to anyone who teaches evolutionary biology, as either a history course or a science course. We have been given an accessible, quality read in the form of an exciting and skilled joust between two knights in the service of today’s king of evolution theory." "The authors’ debate is learned, witty, engaging, and even passionate. Students and Darwin scholars alike will be able to read this volume with interest and enjoyment and be inspired to go back to Darwin’s own writings, especially to Darwin’s early notebooks, the Origin of Species, and the Descent of Man in the continued eﬀort to comprehend Darwin in his historical context." "I learned a great deal reading the complicated and intellectually demanding Debating Darwin, over and over, more times than I can count during the eight months the book has been in my hands. I recommend it to every serious evolutionary biologist and to those armchair evolutionists who remain fascinated with Darwin’s century, and to teachers of history and philosophy."